I know from experience that it isn't easy dressing for a country wedding. With a dance floor which could be a lawn, seating which could be bales of hay to the flagstones in the country church. Negotiating your way across various terrains can be difficult, unless you are prepared. The look to aim for is a combination of style with comfort. Take a pair of chic flats to help you on the dance floor, wear a loose jacket and scarf to add the extra layer in the evening and chose dresses which are either soft and floaty or versatile. I have featured womenswear label 'In One Clothing' once before and I love their dresses. The label presents a collection of multi-way dresses. The aptly named 'Confetti' dress can transform into 14 different styles in an instant. Opt for statement accessories like this whimsical swan necklace by Swan or the Art-Deco inspired ring from V Jewellery. Keep hats subtle and stylish, I am loving everything by Siana Yewdall and Cheltenham's Lisa von Hallwyl. Trying to maintain battery charge at a Wedding isn't easy, especially when taking photos or videos, however with Handbag Butler's 'Mighty Purse' their chic leather clutch comes with a genius technological feature enabling you to recharge your phone twice over. 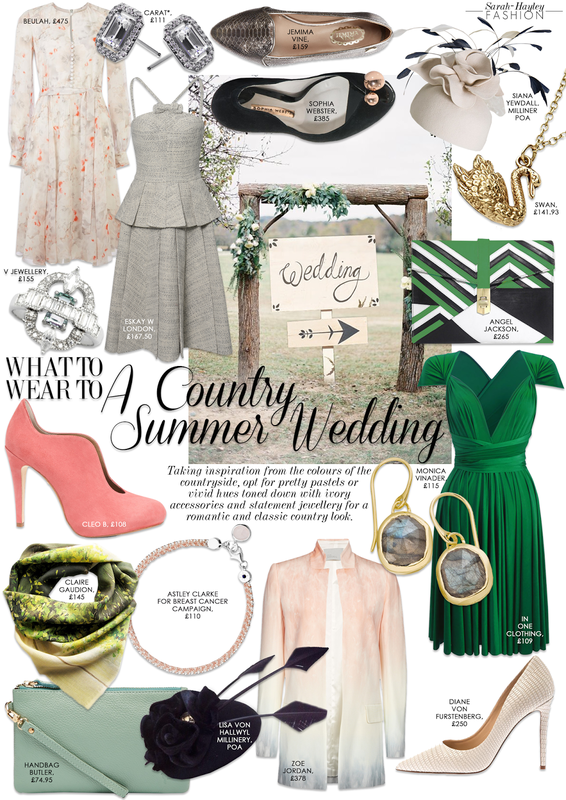 Remember that dressing for a country wedding can still be elegant and modern, rural doesn't have to mean rustic.